Since I was a kid, I've loved digging in the dirt. My mom was an avid gardener. My grandfather and his father and his father...were all farmers, so I guess I come by it naturally. So, when I arrived in the concrete jungle that was LA county, I was determined to start digging. What began as a beautification project soon grew into something more meaningful. As I researched native and drought tolerant plants, I discovered that they were not only more economical than my thirsty lawn, they were also beautiful. And as I set about transforming my front and backyard spaces with Mediterranean plants, succulents and California natives, I discovered an unexpected bonus. My yard became a mecca for bees, butterflies, dragonflies, many different bird species and even a few lizards. In fact, one year a pair of ducks nested near the water feature. These days there's lots of talk about transforming our lawns into green spaces that embrace our natural habitat. Up for the challenge this Earth month? If so, here are a few tips to get you started. Do your homework before you dig. The CA Native Plant Society is a wonderful resource offering tips, plant lists and garden plans. Visit nurseries that specialize in natives, like Tree of Life nursery in San Juan Capistrano. You'll have access to master gardeners and a greater variety of natives than at the garden variety garden center. Start with container plantings. Not ready to rip up the front lawn? Who can blame you. You may be surprised how successful you can be in attracting butterflies, bees and hummingbirds with a native plant container garden. Half wine barrels can even support shrubs and small trees. Get your kids involved. Children love to get dirty and this is a perfect opportunity to play in the dirt! They can help with every stage of the process from shopping for plants to helping maintain your new backyard habitat. Add a water feature. Don't worry, you don't have to be an engineer to figure this one out. A bird bath or large plant saucer works fine as long as you keep it clean and refresh the water often. Avoid herbicides and pesticides. It goes without saying that you won't attract animals to your yard if you're busy killing their food. Stick with organic gardening practices and don't worry if you see the occasional aphid or ant. A pest to you is a meal for others! Need more convincing that a backyard habitat is for you? Check out how a native garden boosted test scores at an LA elementary school. 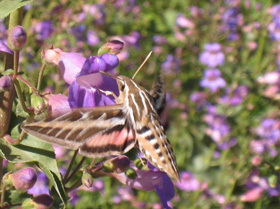 Photo from CA Native Plant Society website.